Of all film genres, science fiction is the one most explicitly linked to the issuing of moral imperatives. This aspect of science fiction is tied to the futural mode in which it occurs. The science fiction genre, as J. P. Telotte claims, allows us ‘to speculate, in the precise sense of the fantastic, on what might or might not be, now or in the future’ (Telotte 2001, 141). By showing us a possible future – often either utopian or dystopian – science fiction films provide an image for us to realise or to fight against. Unlike genres focused on the present (such as melodrama) or genres focused on the past (such as the Western), science fiction, because it is futural, involves a clear break from what is and a plea for what ought to be. Science fiction directs us toward a better future, even if negatively, through the depiction of a nightmarish one. In order to create a critique of society a filmmaker will tend to focus upon a certain aspect of society or a social practice. 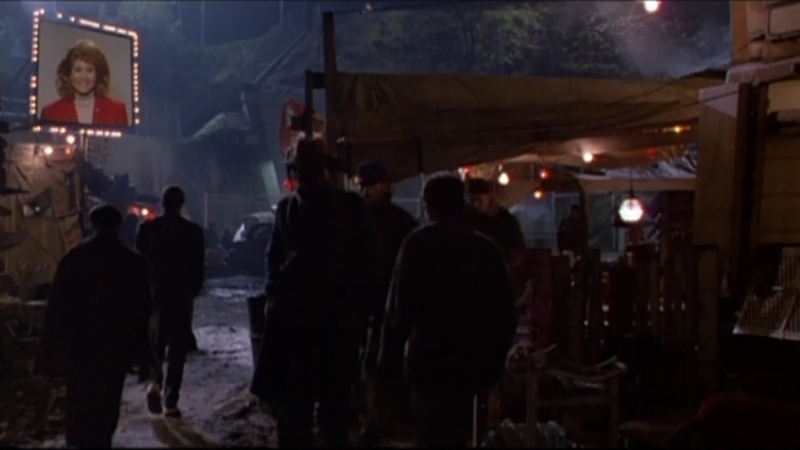 In Rollerball sport is used as the vehicle for the film’s narrative. Rather than extending one particular sport to social dominance a new sport, a combination and synthesis, of several of the most popular sports in America, is developed. Costume in Rollerball is an important aspect in establishing the sport and the futuristic setting. The helmet is a direct replication of the NFL helmets worn in the 70s. The pads also replicate the image of American football athletes. The use of rollerskates produces a similar image, style of movement and tempo found in ice hockey – evidenced in the repeated “bodychecking”. The gloves the Rollerballers’ use, to pick up the ball after it is shot out of a cannon, are identical to contemporary baseball’s outfielder’s glove. The Rollerballer’s costume is a patchwork of several important parts of major American sports. In the future world of Rollerball a grand council of corporate power has assumed total control over social practices, such as sport, and everyday life itself. Corporate power even extends to the ability to revoke a marriage and to take a persons’ spouse without question. In order to establish this sense of corporate cultural control the traditional national anthem is replaced with a “corporate anthem” and every member of the audience willingly stands and places their hand to their heart. The future world of Rollerball, a state dominated by fascistic corporations, is explored through the setting of sport. The sport is established by costume and the allusion to the most popular contemporary American sports. Rollerball, often seen as an anti-sport film – incorrectly as the last image is of the protagonist Jonathan E. finishing the game by scoring then walking away in disgust – creates a critique of the way corporate-media and power is welded to produce and provide the ability to dominate and control society and social practices. (1.) Franklin D. Roosevelt, “Appendix A: Message from the President of the United States Transmitting Recommendations Relative to the Strengthening and Enforcement of Anti-trust Laws”, The American Economic Review, Vol. 32, No. 2, Part 2, Supplement, Papers Relating to the Temporary National Economic Committee (Jun., 1942), pp. 119-128, p. 119. 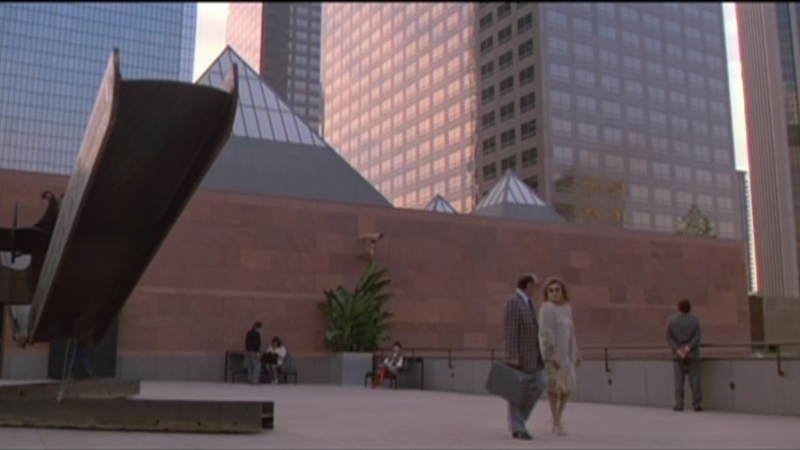 The future world, 2019 LA, of Blade Runner is a cosmopolitan “global village”. This is communicated by the use of bi-lingual advertising signs: Coca-cola sits amongst neon Japanese symbols. Although Coca-cola is an American symbol that is saturated world wide the use of it sat against the Japanese iconography communicates the sense of lost identity. While Deckard sits eating his Japanese food two “Blade Runner” cops stand behind him, and although we are in LA they speak in a foreign language to Deckard who only understands English. He must get the noodle stand owner to translate for him. The fact that an agent of the central authority, the Police, speaks in Japanese rather than English in LA signifies the state of globalisation. The identity that is lost is the local provincial aspects of countries. Instead of an American or Japanese culture we see a cross-breed intertextual mix that produces it own new identity. As I mentioned in my previous post concerning the Postmodern nature of Blade Runner this concept of intertextuality and pastiche culture is important in communicating a distinct future world. Blade Runner asks questions about individuality and authenticity [I will write a post about Blade Runner with the aim to explore the postmodern concept of cyborg ] and the intertextual nature of Blade Runner creates a future world where people have become replicants of imagery and images that “used” to signify something individual but now have become tired. Instead of Deckard being an individual he has become a “replicant” of the film noir detective in his trench coat and hard-boiled character. Similarly Rachel has become the prototypical Femme Fatal, dressed in dark, commanding screen presence and continuously smoking. The future world social structures are communicated in Blade Runner by the opposition of setting, as in Total Recall and Running Man. The internal shots of the headquarters of the Tyrell corp. are luscious and extraordinary while the city streets are dark and rain is continuously falling. As in Total Recall the opposition of two colours can communicate an atmosphere that coincides with the location. 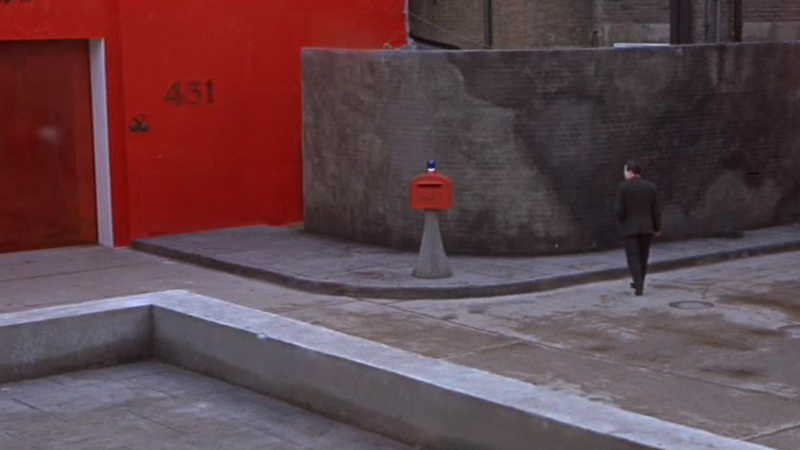 In Total Recall the use of red and whites opposed each other and communicated a mood and sense of place. 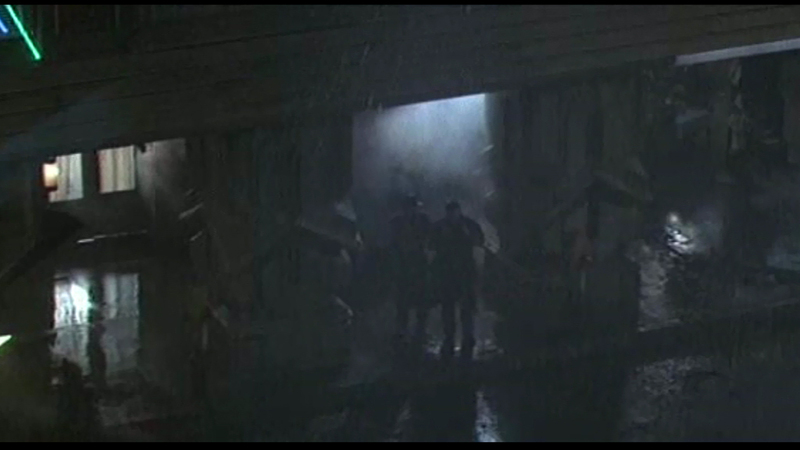 In Blade Runner the use of dark-blues communicate a sense of run-down dirty atmosphere while golds and yellows create a warm glow that surrounded the upper echelons of the Tyrell corp. 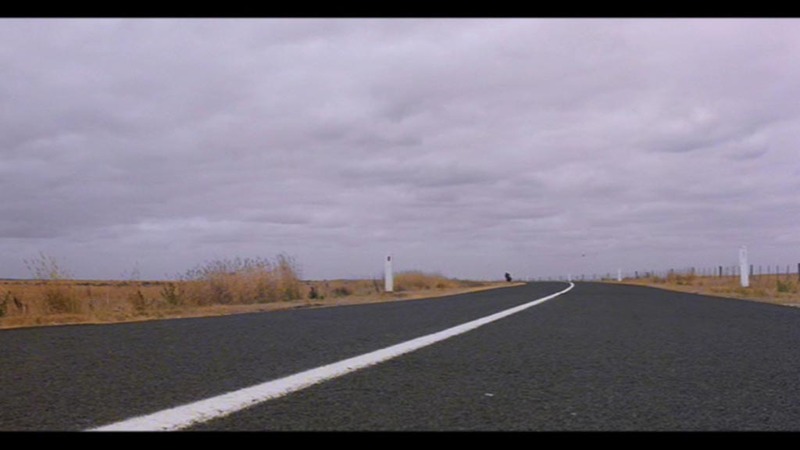 The sense of a dislocated post-apocalypse society is communicated in Mad Max by the continued use of the road as position of action. The main community we see is the biker-gang of Toecutter. Their violent and brutal gang community is a significant signifier of the loss of respect and lawlessness of the future world being portrayed. The use of the bare road set amongst scrub ground also dislocates us from those structures of culture and the past. The bare vision of scrub ground is similar to the wide-vista’s of the western, however the function is radically different. As the western is set in the past the nothingness signifies at least something to conquer and build on. The small towns we know will develop into prosperous cities full of life, law and order (mostly). However because the nothingness of Mad Max is set in the future that nothingness doesn’t signify potential but rather something lost, something worryingly absent. Even the roads surrounded by structures are worryingly vacant as chain link fences occupy the space where houses and drives should be. A lack of work place and offices are also worrying as no driving force for change and redevelopment can be seen. 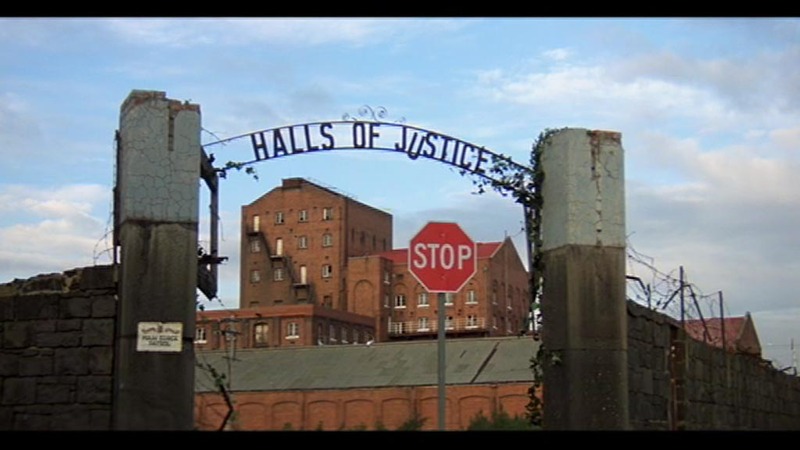 The dilapidated “Halls of Justice” signify the loss of order and law. The damaged and rusted sign symbolises this. Mad Max communicates a dislocated post-apocalypse future world easily by continuously using motifs such as leaving the shots vacant of buildings that signify culture. The use of open roads and scrub land also communicate this a sense of nothingness. In the future world of Running Man we are shown a repressive society that uses the violent show of “Running Man” as a release valve to exert the pressures of living under a repressive regime. The film uses simple diametrically opposed classes of society, with their own lighting codes, to communicate clearly the conflict in the society. 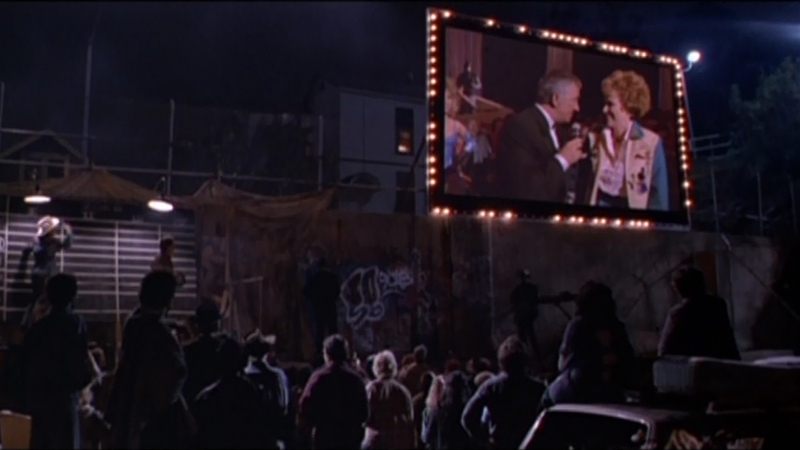 The dystopia is communicated by the contrasting mise-en-scene of the upper-class day scenes and the under-class night scenes. The day scenes are full of natural light and the streets are uncluttered and open. People are allowed to sit, wonder and go as they please. This is the opposite of the night scenes. The night scenes portray the have-nots of the future world of Running Man. In the night scenes we see the under-class living in a polluted and cluttered area. The people are fenced in and contrary to the day scenes there is no casual idolatry admiration for architecture. The masses are penned in and huddled, their only source of light the brightly coloured television screens. The night scenes also consistently include the large television screens indicating the extent of the media’s influence on the masses. In the introduction of Running Man we are told that the government has complete control of the cultural output of the society and that all television is highly censored. If all television is censored then we must assume that violence is allowed because of some controlling value it contains. The use of violence is a cathartic one. Violence is used to burn out the passions of the people so that they have no emotional strength left to challenge the wrongs committed by the oppressive government. Running Man playfully conjures up a society dominated and controlled by violent television. The use of violence as a controlling cathartic force is ironic in Running Man as the film is of the action Sci-Fi genre. Concerns about the corrupting nature of violence in film and television are well documented and Running Man is attempting to play with this notion by creating a world where violent television has enslaved America. Violence has morally corrupted America and it is now a fascist state. The punchline of the Running Man joke is that the destruction of the media controlled state is caused by the superhero protagonist’s ability to dish out equal amounts of pain, gore and brutality against the individuals that ensure the cathartic state of the masses. The future world that Running Man creates becomes a fertile ground in which to jest at the concept of violence as corrupter and as violence as a force through which freedom is gained. In several articles I have spoken about the cinematic and rhetorical device of taking an element, filmic or social, to its extreme to produce a critical reading or fertile ground for critique. In essence all Sci-fi does this. It could be taking the threat of Communist invasion to a symbolic level where the Communists are replaced and the threat transformed into fearsome aliens from outer-space. It could also be taking the environment’s health to an extreme where in we are shown a society which can only feed its populace with a synthesised form of meat produced from deceased Humans. 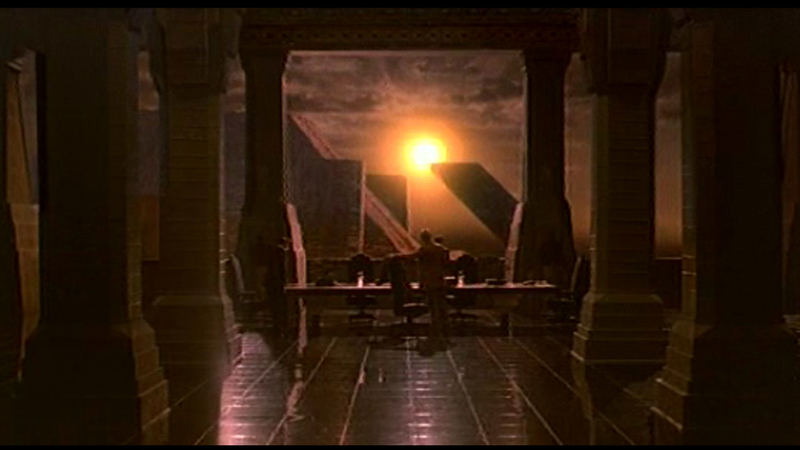 The setting, and the symbols used to produce or communicate this, in Sci-fi, reflect the central concern of the film because the setting of the film is created rather than reproduced. Although obviously the Notting Hill of Notting Hill (1999) is a filmic white-washed version of the geographical location it is only in film genres such as Sci-fi that the setting itself becomes truly and consistently symbolic and a reflection of the central concern of the film and an important vehicle of plot communication. In my ‘Future Worlds’ articles I have, and will, attempt to further communicate this point. * A side note: the setting of Notting Hill is more important as an ideological study of the white-washing of a predominantly mixed race cosmopolitan area into an upper-middle class white English haven of yuppies and celebrities. Modernist architecture is noted for its elimination of ornament and simplification of form. An outcome of Modernist architecture is that it produced large estates with many buildings built externally and internally uniform. The central vision of many Modernist estates, like the Park-Hill estate in Sheffield, were to produce easily reproducible identical living units which would satisfy and reproduce communities ravaged and displaced from their terraced estates by the second world war. Large sprawling streets were replaced with tall expansive high-rise apartment buildings. This style of architecture failed in many estates and rather than being a shining beacon of good planning the estates, like the Park-Hill estate in Sheffield, have become run down poverty stricken and crime infested. The lack of ornament and the Modernist belief in aesthetic uniformity is used in Fahrenheit 451 to symbolise the fictional societies philosophy. Uniformity is cited as the reason why books must be burnt – without uniformity society is violent, passionate and uncontrollable. The contemporary modernist setting of Fahrenheit 451 is used as a site in which the fictional societies philosophy is foregrounded. Another reason why Modernist architecture is used is to produce a sense of familiar. 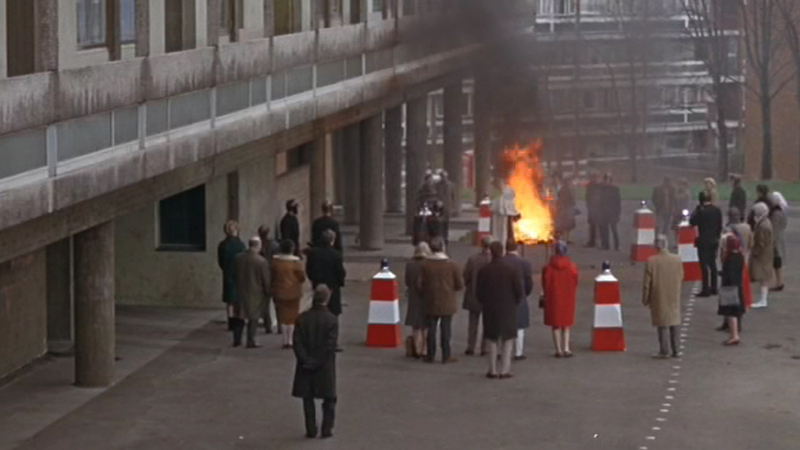 Fahrenheit 451is set amongst the Modernist architecture of the 1960’s – the Alton housing estate in Roehampton, South London. 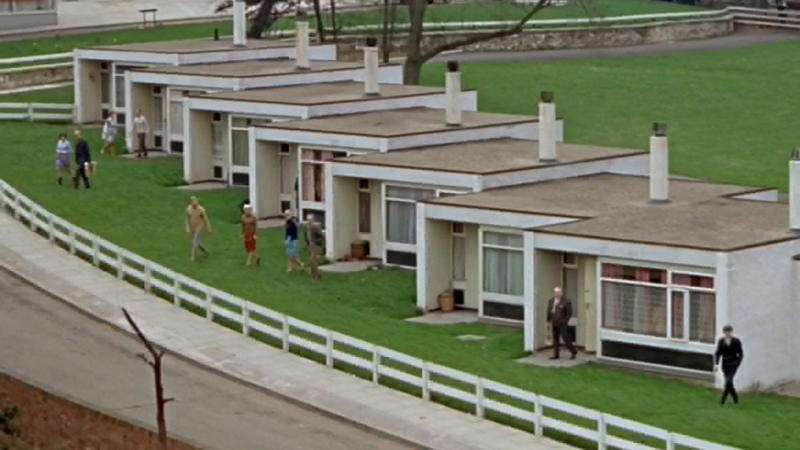 Fahrenheit 451 uses the Modernist estate to to produce a future world built from the contemporary fashion and architecture of the 1960’s. This ensures that the future is not really “when” but rather an extension or an extreme version of “now”. Science fiction has always used the future as a safe space in which to deal with the threats and concerns of contemporary society. However Fahrenheit 451 does not allow this act of distancing – normally provided by the setting of a different and unrecognisable future – because the vision of the “future” in Fahrenheit 451 is evidently still the contemporary world. What this does is produce a critique of contemporary society and life that is unavoidable and unmistakable. Fahrenheit 451 creates a “future” where uniformity has become so important that is has removed all elements of humanity, however; as science fiction critiques the contemporary we can also infer that Fahrenheit 451 is arguing against the very same architecture it is using in the film. It could be said that Fahrenheit 451 is arguing that “ornament”, what Modernist architecture and uniformity removes, is that which makes humanity so interesting and inspirational. Fahrenheit 451 communicates that ornament is the aesthetic response to understanding humanity as impossible to simplify and that “simplicity” of form is the attempt to dehumanize humanity. Therefore Fahrenheit 451 could be seen as a critique of Modernist philosophy of architecture and other rationalising philosophies.